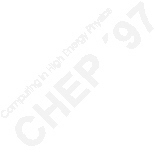 Computing in High Energy Physics (CHEP) is a major series of international conferences for physicists and computing professionals from the High Energy Physics community, Computer Science, and IT industry. The CHEP conference provides an international forum to exchange the experience and needs for the community, and to review recent, ongoing, and future activities. The CHEP conference was organized by Deutsches Elektronen-Synchrotron (DESY) which has locations in Hamburg and in Zeuthen (near Berlin). Oxford, UK (April 89), Santa Fe, USA (April 90), Tsukuba, Japan (March 91), Annecy, France (September 92), San Francisco, USA (April 94), Rio de Janeiro, Brazil (September 95).